Along its entire length, the vast shifting sand dunes of the Namib Desert spread inland for 80 to 130km (50 to 80 miles). In the interior, the escarpment of a north–south plateau slopes away to the east and north into the vast interior sand basin of the Kalahari. In the far northwest, the 66,000 sq km (25,500 sq miles) of the Kaokoland mountains run along the coast, while further inland lies the Etosha Pan (a dried-out saline lake), surrounded by grasslands and bush which support a large and varied wildlife. The Etosha National Park & Game Reserve is one of the finest in Africa, in that it remains, to a large extent, free of human influence. 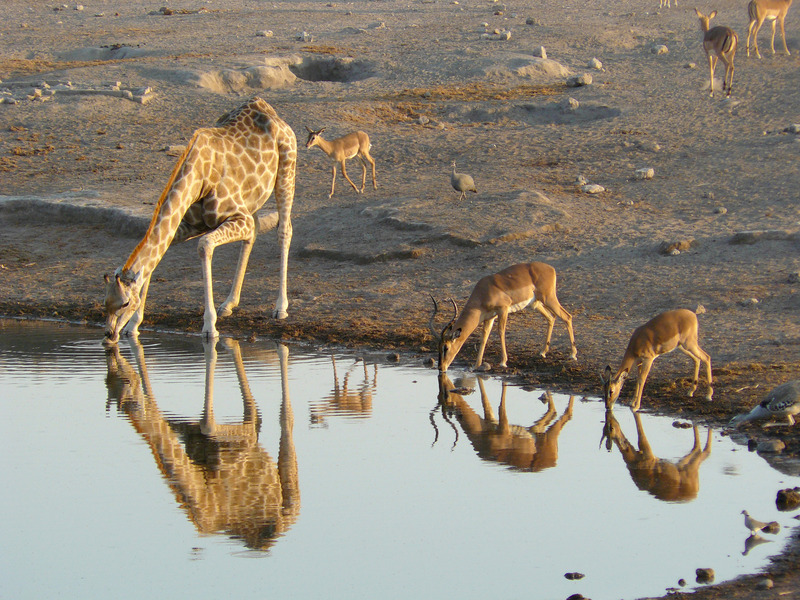 Today’s Etosha National Park was proclaimed as Namibia’s first conservation area in 1907 by the then German government. With subsequent additions it became the largest game reserve in the world, covering a vast area of 93 240 km2. For political considerations its size was progressively diminished, until by 1975 it had been reduced to its present surface area of 22 270 km2. Nevertheless, it is still one of the largest game reserves in Africa. Consisting of saline desert, savannah and woodlands, its definitive feature is the Etosha Pan, a vast, shallow depression of approximately 5 000 km2. For the greater part of the year the pan is a bleak expanse of white cracked mud which, on most days, shimmers with mirages. Seeing vast herds of game against this eerie backdrop, referred to in the local vernacular as the ‘great white place of dry water’, makes the Etosha game-viewing experience unique. Of the 114 mammals species found in the park, several are rare and endangered, such as black rhino, cheetah and black-faced impala. The latter is endemic to north-western Namibia and south-western Angola. Etosha’s current population of more than 600 black rhino represents one of the few growing populations of black rhino in the world. Other large mammals in the park include giraffe, blue wildebeest, mountain and plains zebra, hyaena and lion. Cheetah and leopard complete the trio of ‘big cats’. Antelope species range from kudu, gemsbok and the large and stately eland, to the diminutive Damara dik-dik. Smaller mammals include jackal, bat-eared fox, honey badger, warthog and the ubiquitous ground squirrel. Walvis Bay, situated on Namibia’s coastline and nestled between the Namib Desert and the Atlantic Ocean, is the optimal place in Namibia for both relaxation and fun. Often fondly referred to as the “playground of Namibia, it has numerous activities to choose from, both for adventure as well as exploring the fascinating features of the desert and the animals and plants that occur and survive here. Feel the spray of the cold yet highly marine-populated Atlantic Ocean on your cheeks as you take part in a dolphin cruise with oysters and champagne, or glide through the Walvis Bay lagoon on your own power in a kayak. Find your inner child and push adrenaline to its limits with extreme adventures such as skydiving over the desert or quad-biking and sand-boarding (Skiing?) on the dunes. Take time to get the feel of this quaint town with its historic buildings, museums, shopping arcades and beach bar that has transformed into its own personality by the vibrant use of colour and the bohemian lifestyle. 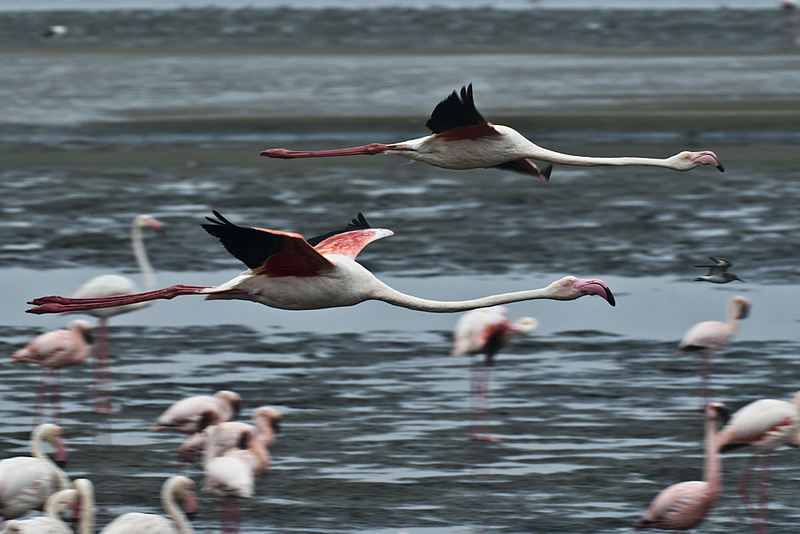 The entire cruise is done in the calm and protected lagoon area of Walvis Bay. Entertainment is provided by two types of dolphins, a large seal colony at Pelican Point and wonderful photographic opportunities of low-flying pelicans. To round off the trip get spoilt with fresh Walvis Bay oysters, snacks and cold sparkling wine. Soft drinks also included. With roughly 350’000 inhabitants Windhoek constitutes the largest city in the country and is situated in a lush and scenically appealing valley of the Auas Mountains, Namibia’s second highest mountain range. Due to its central location, the city serves as the perfect vantage point to Namibia’s vast array of tourist destinations. The cosmopolitan city counts as one of the cleanest in Africa and, with its friendly inhabitants, has been describes as one of the “nicest” cities on the African continent. The city is a kaleidoscope of modern and traditional cultures, fashions and architectural styles. Curio sellers offer their hand made crafts along the bustling city streets, while modern office blocks, flanked by ornate churches and German colonial buildings dominate the skyline. Various excursions are offered in and around the City, these take in a variety of options catering for every need. The below mentioned excursions serve simply as an example, please contact us for any further activities such as city tours, adventure packages, golfing or scenic flights.